Put a reminder on your calendar for the 15th of April because there could be a total eclipse to witness for the first time in more than 2 years. People in the UK will be hoping to see not only a total eclipse but a full on Blood Moon. A Blood Moon occurs when the Earth is placed directly between the Sun and the Moon essentially blocking any light that Moon can reflect from the Sun. What happens then is light from the Sun that hits Earth's atmosphere gets refracted or bent. This light then lights up the Moon with a reddish tint and this is how the name Blood Moon came about. It is estimated that the reddish coloured Blood Moon will be visible for approximately 1 hour in the early hours of the 15th right before sunrise as the Moon works it's way in behind the Earth and out again. 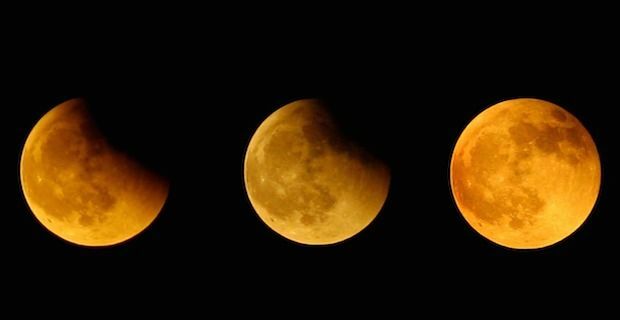 Have no fears about the effects of the Blood Moon on your eyes either because unlike a Solar eclipse, a Lunar eclipse is completely safe to look at without any special equipment. It could be touch and go though for us in Europe though as the those best positioned to catch this eclipse are based in North and South America. People in the UK may just catch a glimpse of the eclipse in the minutes leading up to sunrise if looking at a flat horizon facing in a Southwest direction. Anybody from the UK that happens to be on holidays in the Americas will be treated to the full show without having to worry about daylight impeding their view. If we do end up missing the show then be sure to get online where you can catch the eclipse in all its glory being broadcast online by the robotic telescope service Slooh.